"Tucked away in a secret place, is a teeny tiny nursery full of teeny tiny babies and teeny tiny pets." 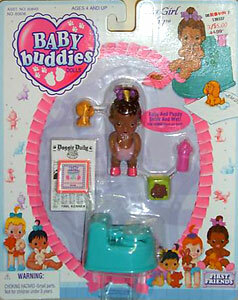 Baby Buddies were produced by Kenner in 1994-95. 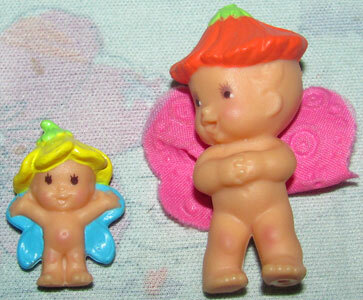 They were a series of tiny babies with magnetically moving parts, which came with tiny pets and accessories. 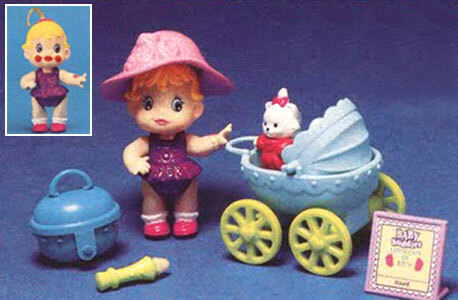 The pets and accessories were very similar to Kenner's Littlest Pet Shop and even used some of the same moulds, so are easily confused. 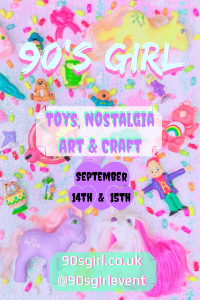 Images on this page thanks to Pranceatron, Zuse and eBay seller Dennis-Collectibles-Dolls-And-Toys and eCrater seller Vintage Doll Closet! 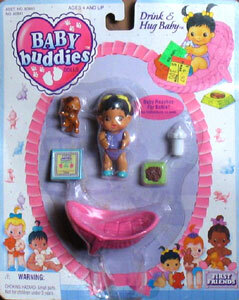 View all Baby Buddies on eBay.com or eBay.co.uk ! "Tucked away in a secret place, is a teeny tiny nursery full of teeny tiny babies and teeny tiny pets. 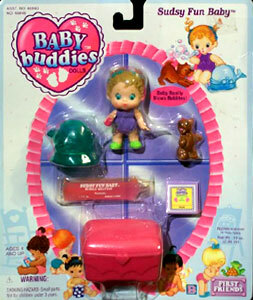 They're special friends - Baby Buddies - who do everything together, like eating and playing, drinking, and helping each other out! 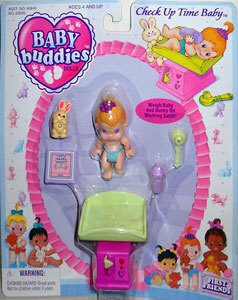 The Baby Buddies are always sharing fun, love, and good times. Because that's what best friends do. But these babies need a Mommy to take care of them. 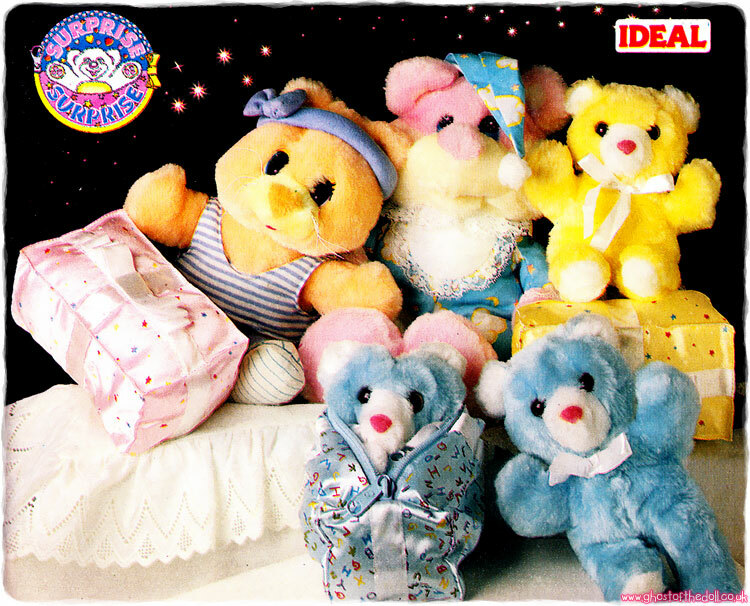 Because if left to themselves, the Baby Buddies would just play all day." 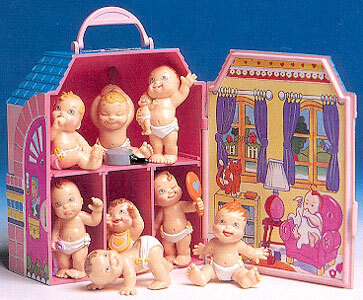 There were seven First Friends produced. 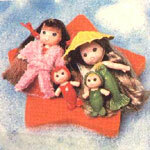 Each doll came with a birth certificate you could write their name on, a pet, one larger accessory and a few smaller ones. 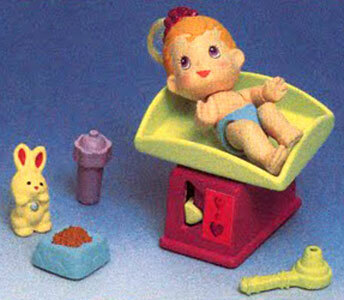 Although Check Up Time Baby is shown with a food bowl in the publicity image, she didn't actually come with one. 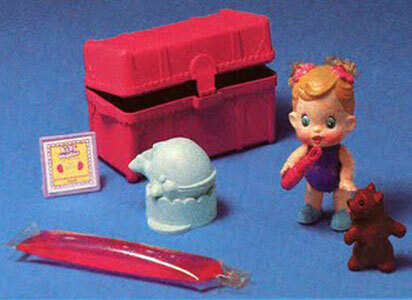 She came with a yellow bunny, purple birth certificate, purple bottle, green scope and pink/green weighing scales. "Baby doesn't want to take her vitamins! Every time the bottle comes close, she turns her pretty head. Can you change her mind?" "It's time for baby's checkup! Put her on the bouncy scale to see how much she 'weighs.' Put her pet bunny on the scale too and see what they 'weigh' together." "Let's have a look-see! Look through the little scope to check baby's eyes and ears. Watch out- she might be ticklish!" "Give your baby a name and write it on her Birth Certificate!" 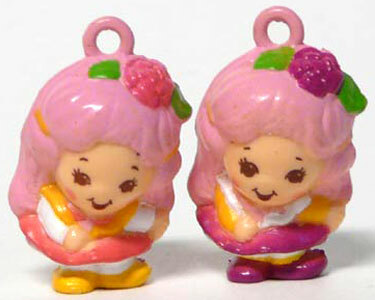 There were at least two slight colour variations of Big Girl Baby. One set had an yellow puppy, green birth certificate and orange food bowl, the other had an orange puppy, orange birth certificate and green food bowl. 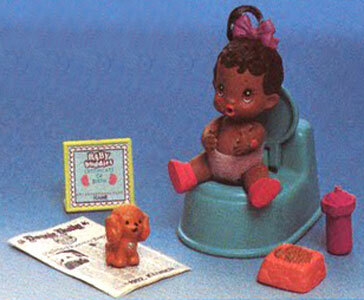 She also came with a newspaper, pink bottle and blue training potty. "Baby drinks her bottle and wets her diaper! Squeeze and hold her bottle under water to fill it, then help her drink it all up. Yummy!" "Such a big girl! 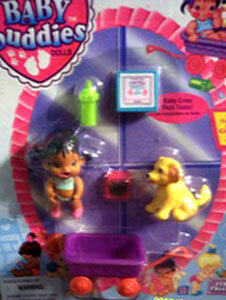 Put baby on her training seat without her diaper, give her the bottle and help her go potty just like the big kids do." "Uh-oh! Little puppy took a sip of baby's bottle - better put him on the newspaper quick!" Dress Me Up Baby came with a white kitten with removable red dress, blue/yellow pram, purple birth certificate, blue basket, pink hat and green makeup brush. 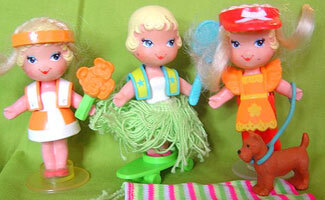 "It's time for fun dress-up play! First, take baby's makeup brush and dip it in icy cold water." 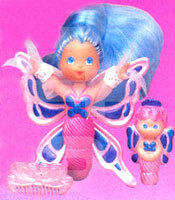 "Rub the wet brush on baby's lips and cheeks and look... pretty makeup magically appears! Doesn't she look like such a big girl?" "Even kitty wants to play dress-up! 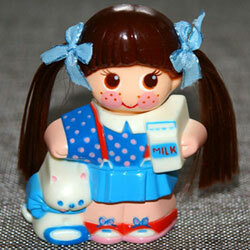 There's a sweet little dress in just her size that the kitty can wear." Unlike the publicity image below, Drink & Hug Baby's pet kitten was brown, not gray, her birth certificate was blue and food bowl green. 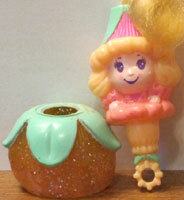 She also came with a white bottle and pink basket as pictured. "This little baby's so hungry, she can't wait for her bottle. Just look how she reaches up for it with her hands when you start to feed her!" "There's nothing nicer than a hug from a friend! Baby loves to cuddle her little kitty in her arms. Aren't they sweet?" "Sharing is fun! 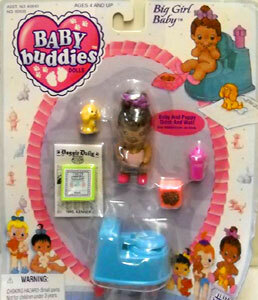 Kitty loves milk and baby loves to share her bottle with her very best friend." 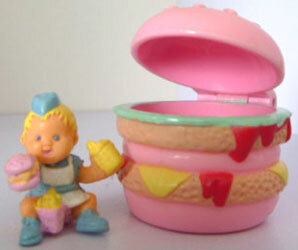 Kiss My Tears Away Baby came with a puppy, purple/red wagon, blue birth certificate, green bottle and pink food bowl. "Does baby want her bottle? Fill it up by holding the tip under water while squeezing and releasing. Now, feed baby the bottle with a gentle squeeze. Oh, no... baby's cranky and starts to cry!" "Puppy doesn't like to see baby cry. Help him nuzzle baby and try to "kiss" her tears away when you press down and release his little tail. No more tears now, baby!" 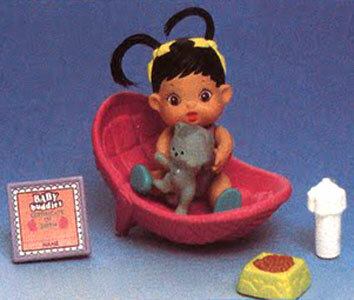 Sudsy Fun Baby came with a pink chest (slightly different from the publicity image), purple birth certificate, brown puppy, tube of bubble liquid and a green (not white) whale shaped container for the bubble liquid to be poured in. "Let's make bubbles! First, have an adult snip the end off the tube of bubble solution and pour it in the whale container." "Help baby dip her bubble wand into the solution. 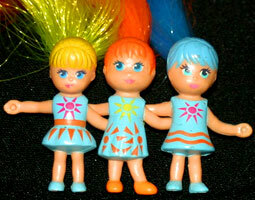 Now you're ready for sudsy fun!" 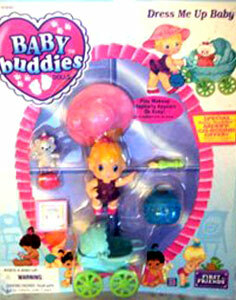 "Give baby's head a quick squeeze and she blows real bubbles! Her friendly puppy loves to chase after the bubbles-can you help him out?" 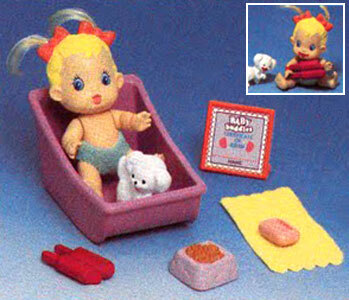 Wash Me Baby came with a pink bath, red ice lolly, white puppy, pink birth certificate, yellow towel and pink soap. "Baby loves her ice pop! When you dip the treat in ice water and hold it to baby's mouth, a messy smile appears. Give puppy a taste and he gets messy too!" 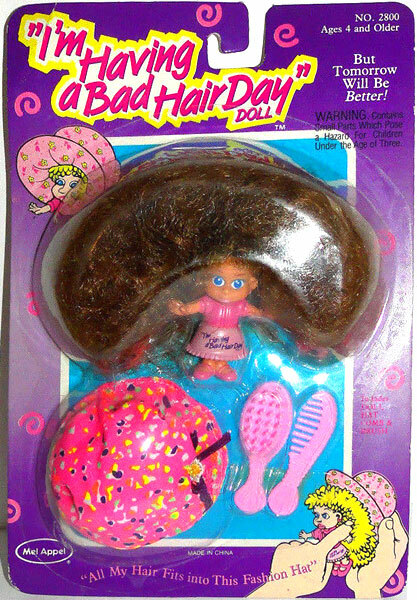 "Into the tub, Little Miss Mess! 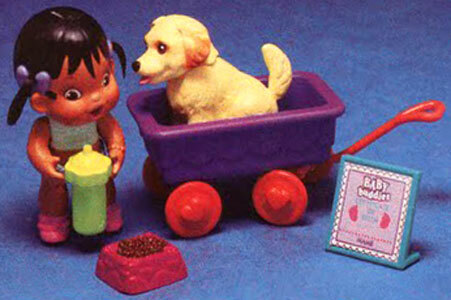 Wash Baby and Puppy with some lukewarm water and they'll be all clean again. Now, try not to get you dirty too!"